One of my favorite things (I know, everything is my favorite) is getting a good steak. And then getting something delicious on top. Like a blue cheese crust. I splurged a while back and picked up amazing filets at Chez Wegmans. Add a red wine and shallot demi-glace, and a blue cheese crust. I’m in heaven. 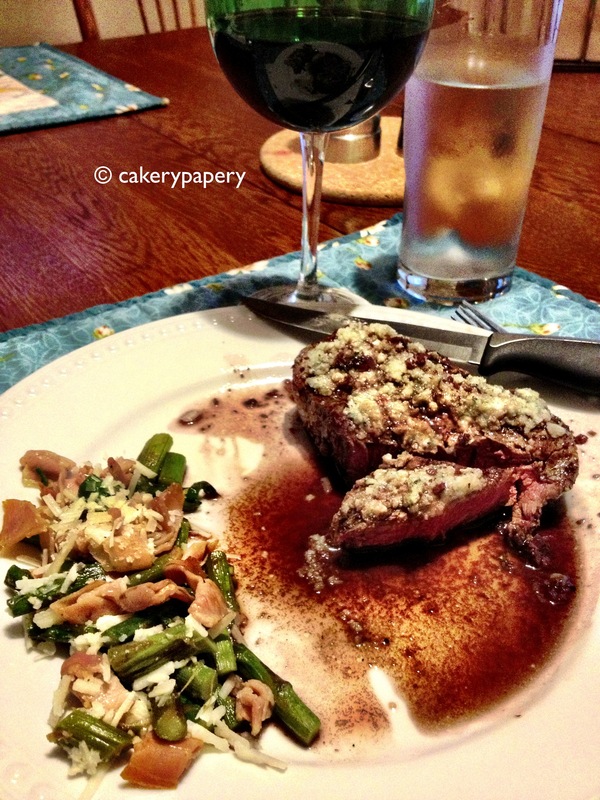 Plus, throw in a side of prosciutto and asparagus topped with parm, and a glass of good merlot, you’re in business. To make the blue cheese topping, all you need is panko bread crumbs and blue cheese crumble. Mix about 1/2 cup blue cheese with 1/4 cup panko crumbs, and top the steaks 1-2 minutes before you pull them off the grill. For the demi-glace (okay, so it’s more like a sauce than a “glace” per say), melt one tablespoon butter in a saucepan. Add a few cloves of chopped garlic, a minced shallot, and some thyme. Saute a few minutes, then add 1/4 cup red wine and just about 3/8 cup of beef broth. Simmer til the sauce reduces, then dress the steak and plates when you pull them off the grill. It’s been a long week. And I’m pretty sure with all the spring fever I’ve been having, this is just the thing I need to read in between the SEVEN meetings I have on a Friday. You know that moment you receive a random text and you want to respond? With something sort of snarky? Good thing there is Textastrophe. I just know its beyond amusing. Get ready to have your productivity take a nose-dive. While 32 of our friends are in Heaven trying to explain what a Hokie is, I stand here sure in the fact that I wouldn’t want to be anything else. And that’s all I have to say about today. So I spent the last week living on a 100-foot dive boat. Sounds awesome, right? But before you get any visions of me partying on a yacht with Diddy…let me tell you about the cabin accommodations. Or, as us fancy folk say, a shoilette. What exactly is a shoilet? Shower + toilet = shoilet. In the correct pronunciation, the word shoilet rhymes with toilet. Imagine a small space, with a stall-type shower, where the shower curtain hangs not to keep the water from splashing onto the floor, but to keep the water from splashing onto the toilet. The entire set up is maybe…two feet by four feet, and that is being generous. Oh, and when you turn around the hit the button to flush, be careful you don’t hit the shower faucet on the wall, else you will have accidentally activated your shoilet and will now be in danger of getting soaked, as there is no way to exit the shoilet without walking directly through the water stream. One of my favorite parts? When installed correctly, the shoilet has two water temperatures when you use the “sho” part. Frostbite, or third-degree burn. And doing any type of activity like, shaving your legs, is near-impossible in the shoilet, because there is barely room to turn around, not to mention if you move you are in danger of touching the shoilet door, which opens when you do as little as breathe on it. This causes the door to swing open, potentially spilling you, water, and your unshaved legs out onto the floor. Oh, and don’t plan on using the word shoilet in everyday conversation, because I plan to trademark the hell out of it. My Dad is a Rock Star. Not a superhero. Those don’t exist. Just a regular ole’ rock star. He has lots of rock-star qualities. Like, throwing amazing parties that consist of nothing more than sitting around the kitchen table with a good bottle of wine. He has a rock-star stage name that, if you are in the know, know him by. He’s a fixer. Changes light bulbs, repairs walls, patches the garage roof, chases bats out of the house. THIS LAST ONE IS MOST IMPORTANT. And he always travels to cool places that have names straight out of Jungle Book or Aladdin. Like I said. Rock star. Probably one of my all-time favorite photos. My partner in crime? Check. Makes a really good prime rib? Check. Has me over for a glass of wine after a long day at work? Check. Brings me back slightly awkward-and-sort-of-weird gifts from his travels? Check. Yup, he pretty much just chills at the corner of awesome and bombdiggity. Happy Father’s Day to all the rock star dads out there. And then I made pie. First, can I just say how cool it is that someone in the Philippines read my blog? Much love to all of you who have been reading, following, and commenting. And now onto the pie. A few months back, on one of my excursions to the mecca of dealhounds, Marshalls, I got this delightful mini-pie press. In the shape of a star. 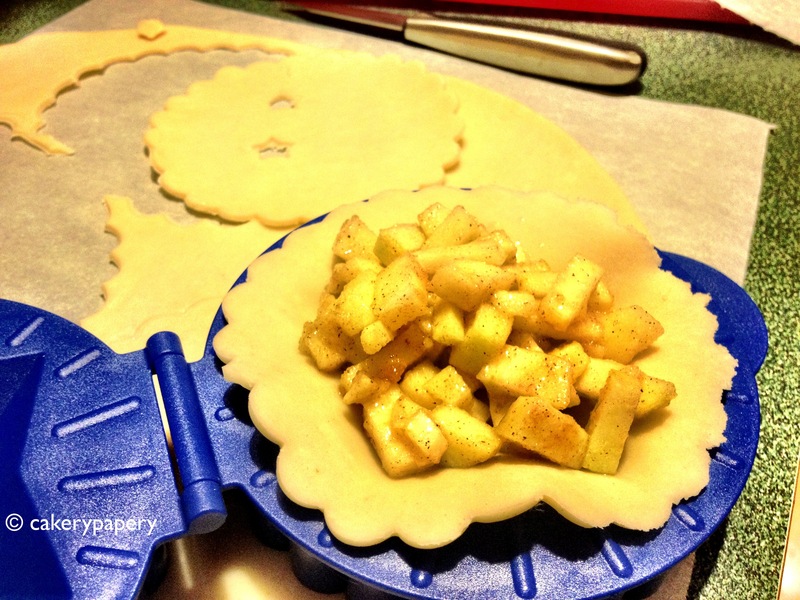 It took me roughly thirty 0.3 seconds to decide that yes, I needed a mini-pie mold. 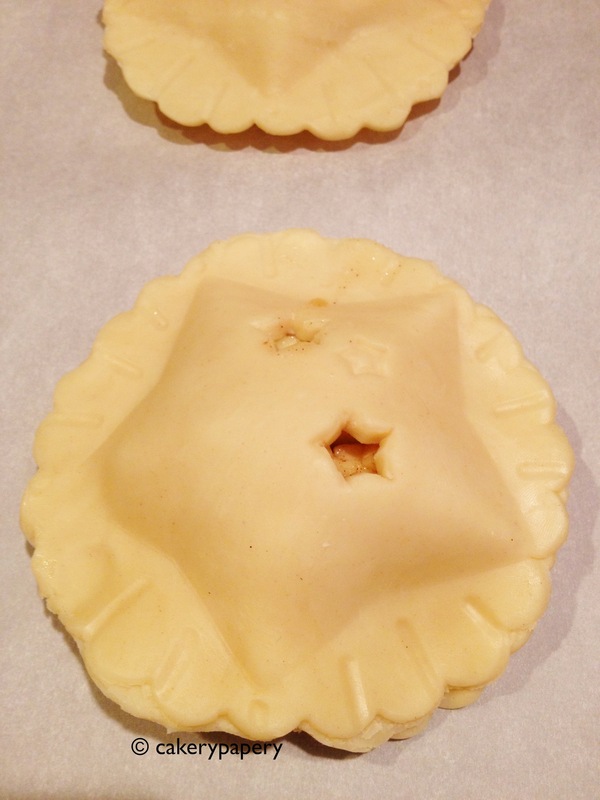 Everyone should own a mini pie mold. 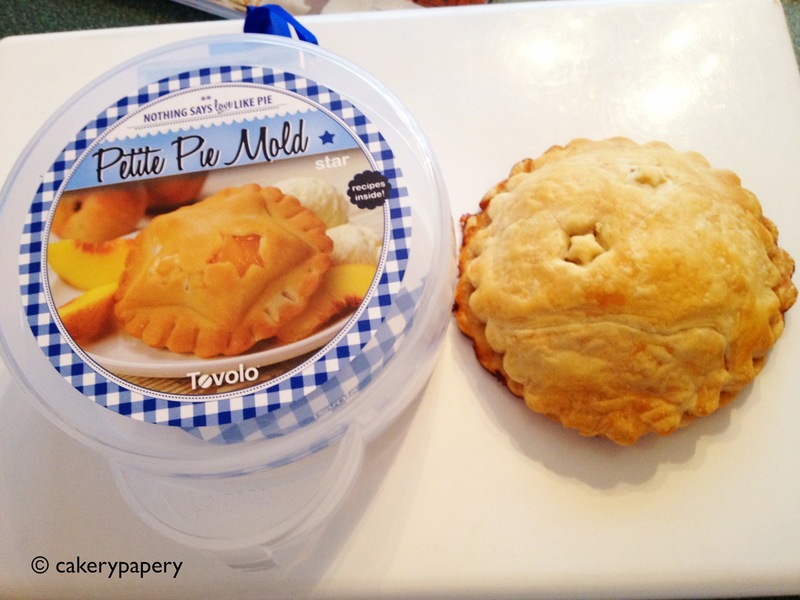 Pie is delicious and mini pies are even better. I hadn’t had a chance to use it, as I didn’t have a good reason for making mini pie. Luckily, I needed to bribe my coworkers. Yeah, luckily. 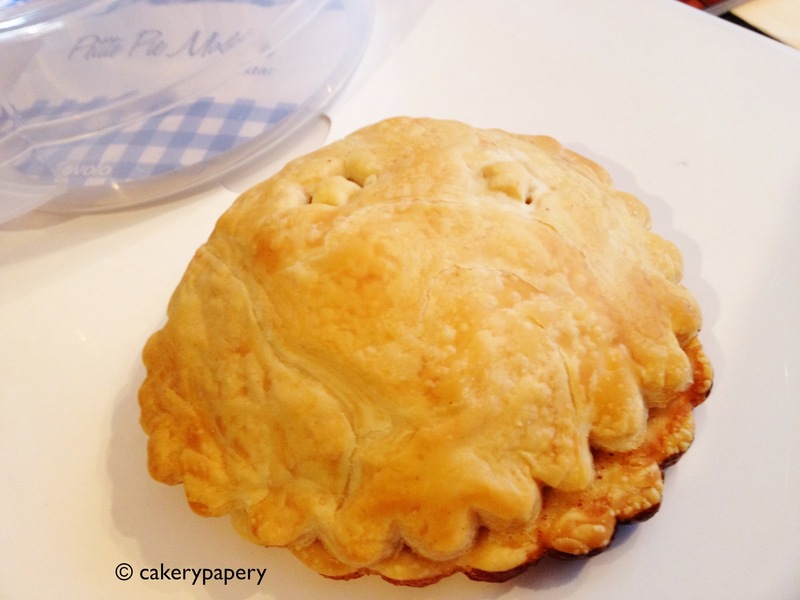 Given that winter in Rochester lasts forever (foooorrrrreeeeevvvverrrrrr), the only type of pie worth making is apple. As I always say, because I’m lazy efficient, I used the Pillsbury roll-out refrigerated pie crust. You can make five pies from one package. You’ll have to combine the dough and re-roll it out to make the last two crusts. I don’t use a recipe for apple pie–which makes it more impressive when people ask if you use a recipe. I more go by a few rules of thumb. The rule of thumb? Get a couple apples. Two apples made the five pies, with some to spare. How about them apples? Three parts white sugar, one part brown sugar. Enough to coat the chopped apples but not too much. Else your filling gets runny. Juice of 1/2 lemon–just give it a good squeeze. Egg wash (i.e. egg yolk + water) to coat the top crust. Combine all the ingredients, and spoon into your pie crust. Make sure you seal the edges carefully and lightly brush the egg wash on. Bake on parchment paper at 400F for about 10 minutes, and then turn down to 325F until the pie looks done. Trust me, you’ll know when it’s done. My only complaint is that my pie did not hold its star shape. Whatever. You can’t win them all. The pie was still delicious. Bonus points if you got all the references without looking at the links.